Lent 2014 at Pilgrims, Part 2! Read about Part 1 here. During our worship planning session for Lent, Mary Ester, one of our members, said we should move the furniture (communion table, pulpit) out of the sanctuary and have the preacher, storyteller, and announcement person be in the open, arid space. Mary said she can hide our bodies behind furniture. Let's break down the barriers between bodies and people. So we did. We have a newly constructed, small, wooden communion table that looks like it might fall over at any minute. The preachers, storytellers, and liturgist are just in the middle of our liturgical space.....with our bodies. I've noticed, within me, this keeps the energy moving. Up until this moment in the service there has been lots of movement in body, energy, and voice. Even though Jeff maybe be moving around just a bit while he's preaching, it's enough to keep up the flow that's already present. The thought of a preacher getting behind the pulpit at this point in the service feels like an energy killer. This means sermons with notes! More vulnerability. More risk. More of the preacher being "seen" by those around. Before we come to the table, we do a walking meditation. As Jesus moved himself towards Jerusalem, his primary mode of being was walking. So....we take on that body movement and posture in a walking meditation before we come to the table. We ring a meditation bell, Rob (our music director) starts a very simple droning on the piano, and people walk mindfully around the sanctuary. One of the leaders offers up three meditation questions, one at at time, that are based on the theme of the Sunday + Biblical character. Examples: When the blind man was healed, I wonder what that healing felt like in his body? I wonder what healing feels like in our own bodies? After about 5 minutes of walking with questions, we come to the table singing "Come Bring Your Burdens to God" and stand near the table in mountain pose under the three crosses. The question becomes: where will you stand? Close to the table? Out on the margins of the mashed up community? The invitation is a "all is welcome, no exceptions" and claim your own place at the table. Where will you stand? Close to the table? Close to others? On the margins of the mashed up group? What pushes your comfort zone without putting your body in major discomfort. This is yoga---finding your edge. Taking your body to the edge is place between new sensations and pain. You seek new sensations. Avoid pain. This is how change takes place in the body. We offer time for prayers---for broken and whole bodies, for the broken and whole planet. Our communion liturgy is improvised. Jeff and a couple of others have chanted some initial words that move us through the Prayer of Great Thanksgiving and people call out the content. Example: Let us give thanks for the planet which God created (chanted). What of creation do we need to give thanks for? (spoken) People call out the thanks. We work our way through the primary elements of the Prayer. We improvise the Words of Institution. Example: Leader shares "On the night before Jesus was betrayed, what happened?" People fill in the rest of the story. It's a multitude of voices at once. We share the bread. Share the cup. Offer anointing of hands with the words, "Jess, your body is sacred." 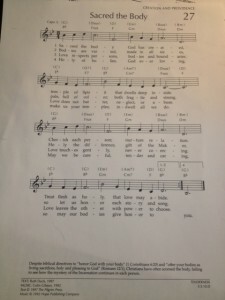 Our closing hymn each week in worship. In the next blog post on liturgy, I'll give my reflections on the liturgy as a whole and the "back story" ritual and movement theories that are present.